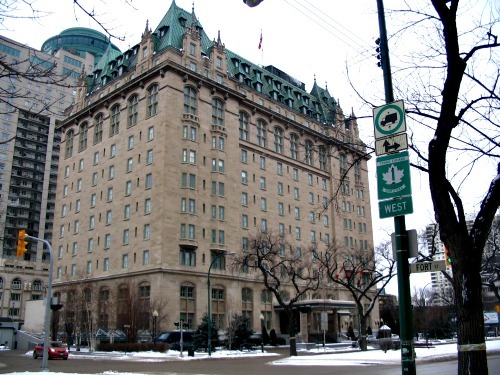 Is the Fort Garry Hotel Haunted? The Fort Garry Hotel was built in 1913 by the Grand Trunk Pacific Railway and at the time of completion, was the tallest building in the city. The hotel was just one of many built by the transport companies and received excellent business bought in by its trains since the day the doors opened. The hotel was purchased by the Canadian National railway to be added to their own huge network of hotels, but was later sold in 1979 to the John Draper Perrin family of Winnipeg, who operated it as an independent hotel until 1987. Today the hotel is privately owned and operates as one of the finest hotels in the city. The hotel has a rather well known and classic ghostly tale to it, and that is of the haunting of room 202. The story goes that a woman was in that room when she heard news of her husbands death due to a car accident. She was so distressed at the news that its said she then went into the closet, shut the door and hung herself. Many stories have come out this room including the crying from the corner of the room when people are lying in bed, and tapping noises coming from inside the closet. Also photos taken within this room often come out severely blurred even when pictures taken from other areas of the hotel are normal. The sensation of being watched and electronics playing up are often reported within this room. There are also some claims of people who have seen blood dripping down the walls upon entering the room but this sounds a little much in my opinion. Former Liberal MP Brenda Chamberlain stayed in this room in 2004 and claimed that during the night she twice felt someone climb in her bed along side her, only to find no one there upon turning on the lights. The hallways of the upper floors are home to the apparition of a young lady dressed in a white robe who has been seen walking down the hallway before fading after walking a few yards. How many ghosts reside at the hotel is unknown as there are all kinds of claims of various ghosts, such as an employee who claimed to have seen a man wearing Victorian era cloths sitting at a table in one of the closed dining rooms, only to find he had vanished with no were to go upon returning with another staff member. There's also claims of a woman wearing a red ball gown who appears to be made up a shadowy mist who likes to walk the lower rooms of the hotel.